This is my Excalibur Food Dehydrator…and I love it! It is a work-horse and has helped me to put up a ton of food in the last 12 years or so that I’ve owned it. 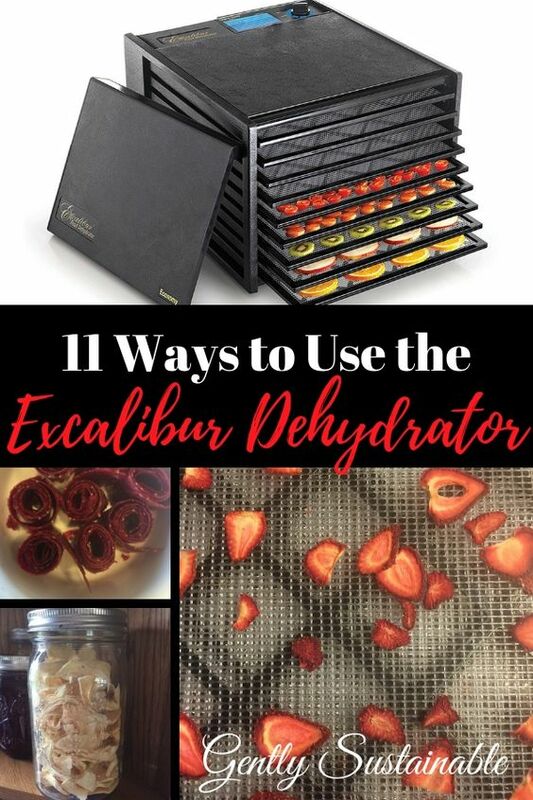 Let me share with you a few of the ways I use the Excalibur Food Dehyrdator! First, I need to say that I’m not a “product pusher”. Never have been, it’s just not my style. However, as the author of a sustainable living blog, I feel that I have a responsibility to educate and to promote good quality, dependable tools. Money is too hard to come by, why waste it on cheap products that won’t last or perform the way you need them to? I’ll be honest, I had to save up for my Excalibur. Sure, it would have been so easy to just “buy the cheapest” one and get by. But I wanted a dehydrator that had good ratings and reviews, from a company that had been around for a good long time. Excalibur has been around since 1973 and manufactures their dehydrators in Sacramento, California. I also wanted a dehydrator that performed, with accurate temperatures and air flow. The final product is critical! If food isn’t dried correctly, it might go bad and not get to be eaten. Tray size is important to me as well, I don’t like to be restricted by round trays. I can’t get as much as I need to on them! My Excalibur trays are 15″x15″! That’s 225 square inches per tray! I got everything I wanted and more, again, I love my Excalibur! Worth the money, and if you have to save, worth the wait. Excalibur has a wide variety of sizes and styles available, check them out! With that said, I can’t wait to share with you all the ways I use my Excalibur! It is one of my most used kitchen appliances! 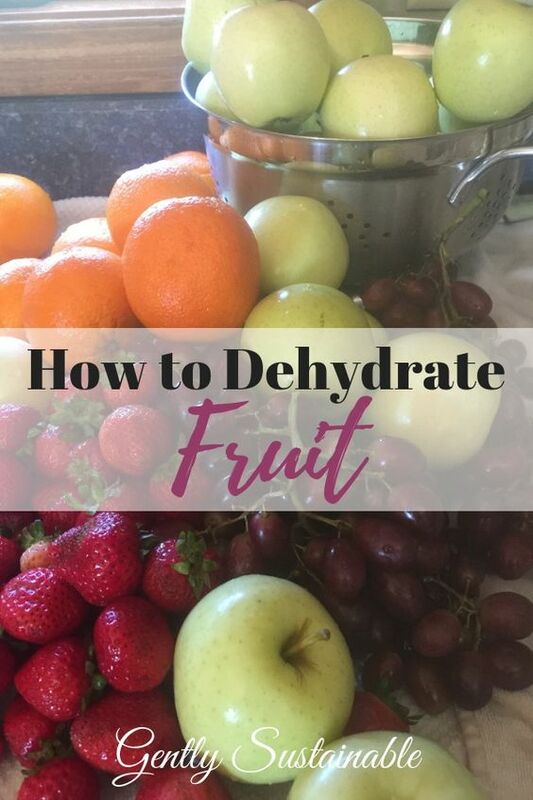 Fruit is one of the easiest foods to dehydrate! Most fruit will simply need to be washed and peeled (perhaps treated for darkening), then cut into 1/4 to 3/8″ slices. Place them on the trays and set the temperature for fruit! Easy! I have dried apples, pears, strawberries and grapes sitting on my counter right now that I’ve been working on, getting ready to go into jars for labeling. Dried fruit can be used for munching, but also baking! Reconstitute your apples and you are ready to make an apple pie! Crumble up the strawberries and toss them in your quick bread batter or over pancakes! I am constantly finding new ways to enjoy dried fruit! Dehydrated vegetables are one of my best kept secrets in the kitchen…it’s how I can throw a meal together in nothing flat! With just a few minutes of prep time, I can have a soup, stew or casserole ready to go by using dehydrated veggies! Winter time brings basketball season around here, which means that we’ll be running to and from games in the evening. When everyone is starving after the game, it’s great to know that I have a homemade and nutritious soup or stew waiting for us at home in the slow cooker, made from dehydrated veggies. Did you know that you can dehydrate frozen vegetables from the store as well??? Yep, and the cool thing is that you don’t have to blanch them! Just spread them out on your handy-dandy dehydrator trays and let ’em dry for 6-10 hours! OK, I love herbs. So much so, that I harvest herbs 9 months out of the year. I grow culinary and medicinal herbs, but I am also a forager, who likes to bring home everything from chickweed to dandelion. All of them go right into the dehydrator, without much effort at all! My Excalibur allows me to take advantage of fresh herbs that I have access to by drying them now, and storing for later use. Once winter is here, I pull many of my dried medicinal herbs out of the cabinet to make salves and teas. Fruit leathers are so healthy and easy to make! Plus, it’s the perfect use for surplus fruit that’s “on it’s way out”, but not gone bad yet. Simply use the dehydrator sheets! Here’s some yummy fruit leather recipes for you to try! Don’t forget about your “fur babies”! I’ll bet you never thought about making Fido and Whiskers treats in the dehydrator! Why use the oven to make granola when you can just toss it in the Excalibur? So much easier, plus it won’t use as much electricity. Here’s my family’s favorite granola recipe! After drying your own fresh herbs and spices, you could take things a step further and make your own herb and spice seasoning mixes! We purchase a whole beef every year, and there are times when I just need to get some of the cheaper cuts used up. One way I do this is to make Beef Jerky. Using a round steak, I’ll simply cut the steak into 1/4-1/2″ slices and soak in a jerky mix for a few hours. Then place beef strips on the trays and dry. My family absolutely LOVES my jerky! When you’ve got too many eggs coming in, or find them on sale at the store, you can whisk them up and let them dry on the Excalibur drying sheets. Once dry, grind up the eggs into a powder and reconstitute (1 part powder/1 part hot water) to use. Ever make doughy art projects that are super slow about drying? Use your dehydrator! Who doesn’t love the smell of potpourri? Make your own by drying fruit, spices, herbs and flower to create your own combinations! Isn’t it amazing that you can do all of this with the Excalibur? The possibilities are just endless, what a valuable tool for any kitchen!